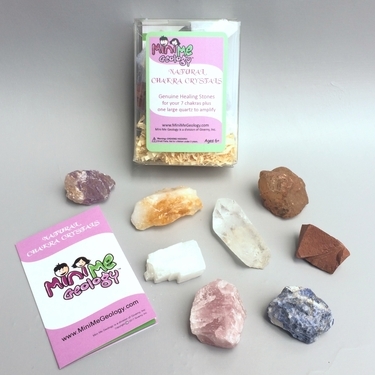 You will love this set of rough, natural Chakra crystals. The set includes eight large 1 to 3-inch samples - one for each Chakra plus a quartz point crystal to amplify the effects of the other crystals. The body has seven major Chakra centers through which we gain physical, emotional and spiritual energy. For optimum wellness, it is beneficial to have all of your Chakra centers balanced, clear and energized. Each Chakra focuses on a specific area of your body and is associated with a different color. You can use these crystals in their natural crystal form to balance, clear, heal and energize your Chakras. Information cards about each Chakra are included with the set. 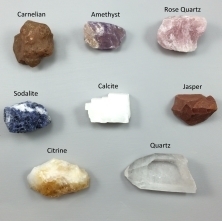 Because these crystals are natural minerals, each sample may be slightly different in size, shape and appearance. Each stone is a genuine crystal that you will enjoy for years to come. Samples obtained worldwide. Assembled in the USA.